I have to share a really cool post I stumbled across late last night. You know those articles that inspire you to actually get out of your chair and go shoot pictures? Yeah. One of those. Dan Newton, a 25-year-old Nevada-based shooter, calls himself a hobbyist. Although from the looks of his images (and what magazines have featured him on their cover) you wouldn't believe it. 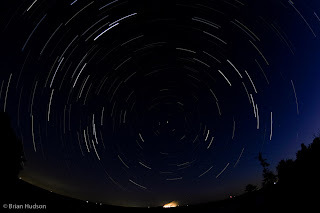 This kid is putting out some truly amazing star trail images and you have to check him out. In this article he lays out his process for shooting them. In the digital world, shooting long exposures is a little different than in the days of film. Locking open your shutter for hours usually means enough noise to kill a shot, but instead by capturing a series of short images and later blending them in post-processing (with help from an easy program called StarTrails), you can end up with a beautiful image. Seriously, though. Advice or comments would be greatly appreciated. Star trails are one of my most favorite displays of frozen motion and I think with practice I could make some decent shots.